My “yard birds” include Brown Noddy, Audubon’s Shearwater, and Northern Fulmar. No, I’m not a lighthouse keeper! I live full-time on a cruising 34-foot catamaran. But when it came time to give up the land home, that meant leaving behind my conservation projects. My birding was destined to be emptier without my IBA surveys, nest monitoring projects, and those cherished Christmas Bird Counts. A bird count! I had the answer to my dilemma as I pondered my bird-conservation future afloat. Inspired by the phenomenally successful Audubon Christmas Bird Counts, I would work to mobilize all those other birders-aboard to count birds at sea. It would be a “SeaBC” Sea Bird Count. 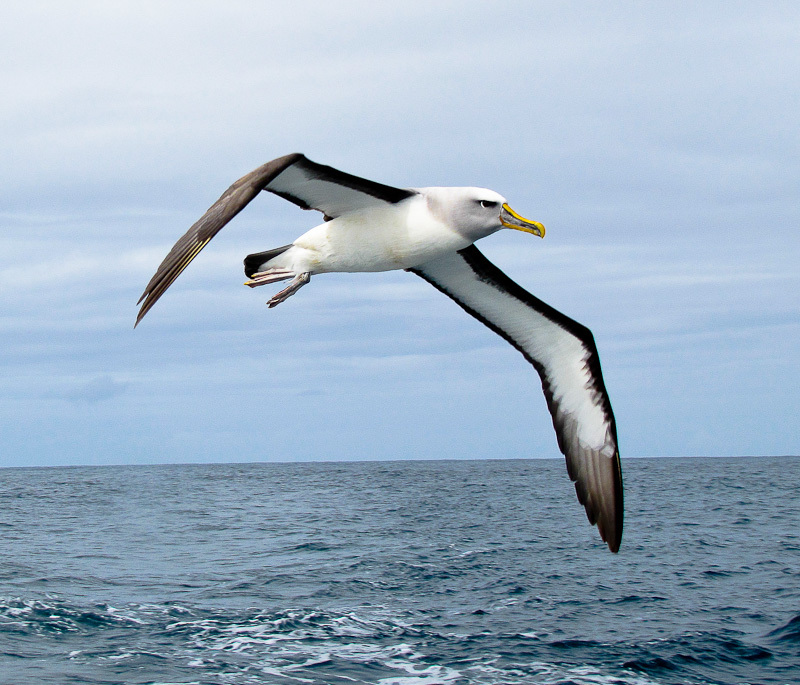 A Buller’s Albatross approaches s/v Tenaya near Stewart Island, New Zealand. Photo by Jim Thomsen. Data would go to eBird (and, by reciprocity, to BirdLife International) where boaters’ sightings could become a resource for scientists worldwide. With seabird populations at risk, yet very little baseline data, it was time to start harnessing all those binoculars and digital cameras aboard. I began by recruiting a group of distinguished long-distance birdwatching voyagers from around the world to form an advisory board. ABA members may recognize some of the names: Beth Leonard, high-latitude sailor and author of Blue Horizons; Brenda Free, Caribbean sailor and artist; Devi Sharp, wildlife biologist and writer; Jeanne Socrates, oldest female solo circumnavigator; Katharine Lowrie, ecologist and compiler of the Seabird Breeding Atlas of the Lesser Antilles, Wendy Clarke, columnist for Cruising World magazine; and Yvonne Katchor, a five-continent sailor with a life list over 2,500 birds. All these amazing sailors were also avid birders! 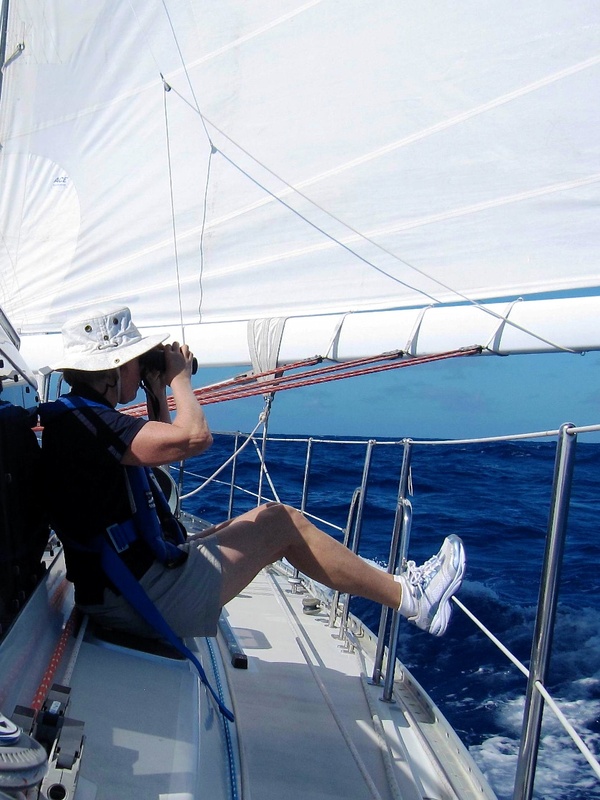 ABA member Dorothy Wadlow on s/v Joyant scans the horizon during a SeaBC about 500 miles off Antigua during a transatlantic passage. Photo by Tom Wadlow. This winter was the inaugural year of the count. Participation spanned over 100 degrees of latitude — from the Gulf of Maine at North 48º to South 58º on Antarctica’s Weddell Sea. Of course, most counts were from more temperate latitudes, such as the islands off Africa, Chile’s Golfo de Penas, and the Caribbean. A SeaBC count off California’s Channel Islands became the impetus for establishing monthly seabird surveys on regularly scheduled trips. 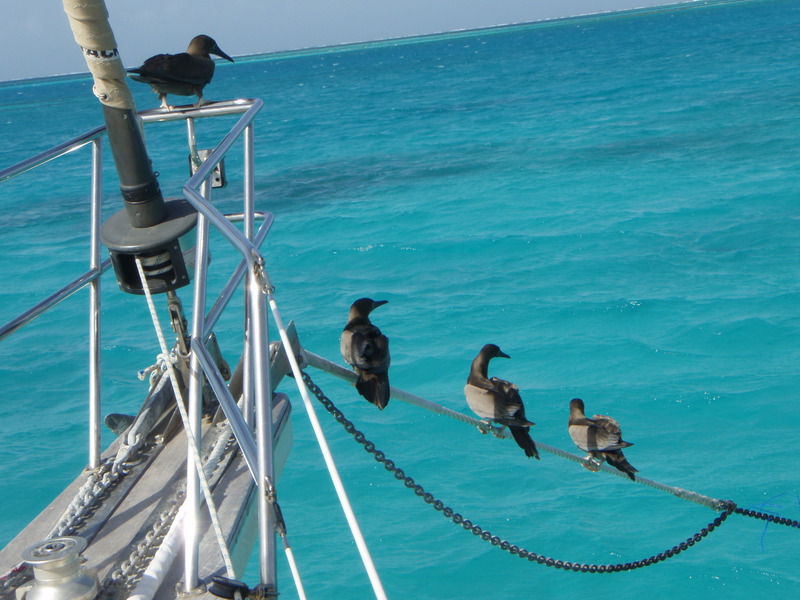 The Bahama’s Exuma Cays Land and Sea Park hopes to use the SeaBC to involve the wintering yachting community in seabird surveys. Boaters are intimately connected to the avian life around them, as with these Brown Boobies that landed on s/v Arctic Tern in Las Aves. Photo by Devi Sharp. The reported species read like a pelagic birding wish-list. Pacific SeaBC highlights included Black-browed and Wandering/Royal Albatrosses; Southern/Northern Giant-Petrel; Northern Fulmar; Westland and White-chinned Petrels; Pink-footed, Sooty, and Black-vented Shearwaters; Wilson’s Storm-petrel; Pomarine Jaeger; and Cassin’s and Rhinoceros Auklets. Atlantic SeaBC highlights included Harlequin Duck; Gray-headed, Black-browed and Wandering Albatrosses; Northern and Southern Fulmars; Cape, Herald (Trindade), Fea’s, Blue, Bulwer’s and White-chinned Petrels; Antarctic and Slender-billed Prions; Cape Verde Shearwater; White-faced Storm-petrel; White-tailed and Red-billed Tropicbirds; Magnificent Frigatebird; Brown Booby; Black-legged Kittiwake; South Polar Skua; Dovekie and Razorbill. 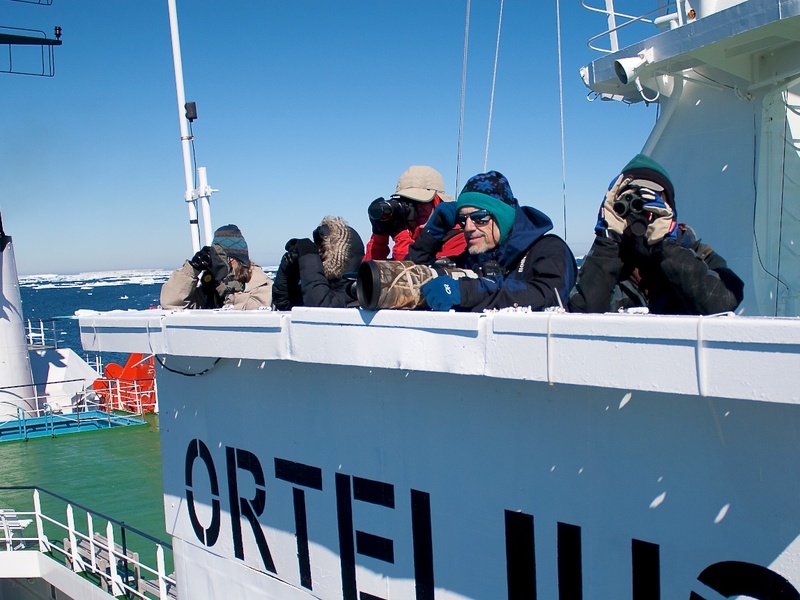 ABA member and tour leader Jim Danzenbaker (on right) organized a SeaBC count during a Cheesemans’ Ecology Safari expedition cruise in the Weddell Sea of Antarctica. Photo by Pablo Fernicola. We’re already gearing up for next year’s count and adding another count in June to involve the northern latitude sailors. In the meantime, we’re encouraging long-distance sailors to take digital photos of any seabirds, noting the latitude and longitude, and reminding them that eBird is open for submissions all year! For more information on the SeaBC, including a downloadable Information and Tally Sheet, visit www.facebook. com/Birding.Aboard. This community page lets boaters share sightings, receive identification help, and connect to other birders aboard. – Team up with a friend who owns a sailboat, sportfish or trawler and add to the count. Boat owners are often looking for a good excuse to head out onto the water! – Count from a cruise ship or yacht charter. Encourage your eco-tour cruise or pelagic trip to contribute a count as an on-board activity. – Help with bulletin-board outreach. Anyone can contribute immensely by printing a couple of copies of the SeaBC poster and posting it at a local marina or yacht club. Email me at diana at birdingaboard dot com to receive the PDF. Diana Doyle writes the Tools of the Trade column in ABA’s Birding magazine, where you might have noticed that her hometown seems to change with every issue. That’s because she lives full-time aboard a 34-foot catamaran.